Slowly but surely our snow is melting. More is predicted for later this week, but hopefully we are on the downhill side! The last link is *almost* every herb in the cupboard, nevertheless it's a good start. I can't recommend enough having a good mortar and pestle. Years ago I had a marble set, but somehow in a move it was mislaid. Now I use a vintage wooden set - I suspect it's oak and handturned. Over the last couple years I've learned the value of buying herbs and spices fresh. The difference between a reputable bulk dealer and those little overpriced bottles at the local grocery store is staggering. A week ago I stopped at my local herb store The Well to pick up another 8 oz of Italian seasoning. When I left I ended up with powdered rosemary, oregano oil, and a bottle of stinging nettle tincture, in addition to the Itlaian seasoning. Linda is right - powdered rosemary is much tastier on roast chicken than dried rosemary. Use these links to expand your choices and then we'll talk about what you can plant in your own garden this spring. 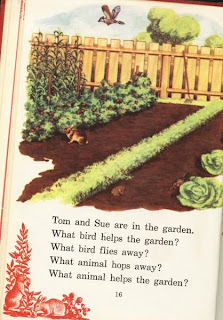 This is Tom and Sue in the winter. 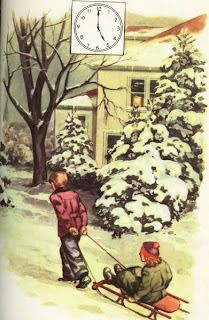 See Tom pull Sue on the sled. Everything is buried under deep, deep snow. 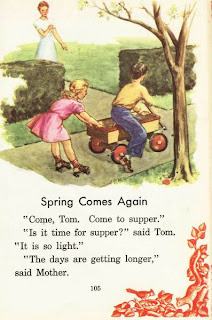 But no matter how cold it gets, eventually it will be spring. 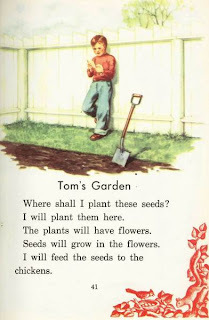 Like Tom, we will plant our garden. We will plant lettuce, broccoli, onions, peas and spinach. 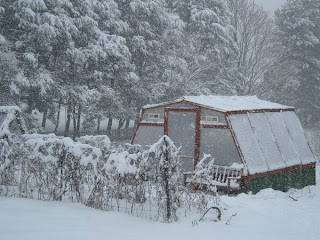 And when it is even warmer, we will plant tomatoes, beans, melons and peppers. Just as soon as this d**n snow melts. 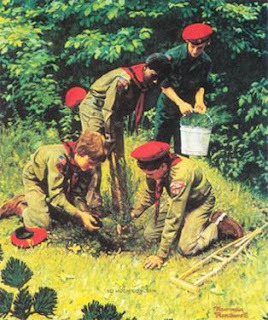 The Boy Scouts were founded in 1910, when Norman Rockwell was 16 years old. Two years later he walked out of the offices of Boys Life magazine with a commission and what would become a 60-year relationship with the Scouts that included hundreds of paintings. He said he loved painting the Scouts during "the time America believed in itself." Happy Birthday Norman! With any luck, America will believe in itself again. 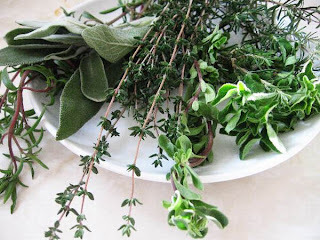 Last October I posted a lovely sage rinse recipes for brunettes and somehow neglected the redheaded and blonde readers. This is inexcusable, particularily since I have a daughter with red hair. To make amends: in place of the sage rinse, simply use a hibiscus rinse. The Hibiscus (also known as sorrel or rosemallow, for those of you with old-timey herb books) is actually part of a very large family with approximately 200 or so members and it grows around the world from temperate to tropical regions. It can be an annual, perennial, a plant or a small tree. It also appears regularly at your local greenhouse, Lowe's or Home Depot in the spring, at a very affordable price. Easy to grow, hard to kill. The flowers come in many colors, and grow darker as they age. A hibiscus rinse works the same way as the sage rinse. First decide if you want to make a large batch for several weeks, or just enough for tomorrow's shower. Then, bring either a cup or a pot of water to a boil (I use the same pot I make pasta in for dinner. It's 4-5 quarts approximately, enough rinse for at least three weeks). Try to avoid using metal pots. 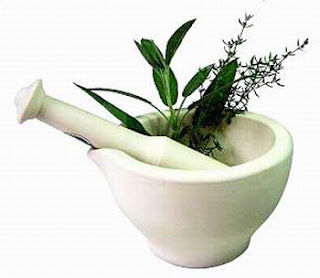 The West Africans believe that metal dilutes the active properties of the plant. Use glass, teflon-coated or ceramic-coated. 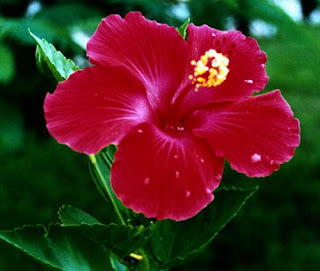 Remove from heat and add the hibiscus (either fresh-picked flowers or dried herb: 1 flower for a cup, 4-5 for a potful; dried herb approx 2 tablespoons for a cup of rinse to 2 cups for a potful). Let it steep and cool, preferably at least 24 hours. Drain and discard the flowers or dried leaves, and store the liquid in a tightly capped bottle. Currently I use clear glass bottles, but I'm thinking dark brown bottles would preserve it even longer. To use just shampoo and condition your hair as usual, rinsing afterwards. Then pour the hibiscus rinse on your hair. Leave it in and dry your hair. Repeat with every shampoo. Initially you will notice a bit more shine, less flyaway hair. With each use, you'll notice a bit more shine and control. If you have gray, it will slowly disappear over several weeks. Now, as to using fresh flowers or dried leaves. Either works. With sage, I have found that fresh seemed a bit more fragrant in the bottle and it seemed to keep better. Remember, your store-bought products have preservative chemicals in them to keep them fresh. This homemade product does not. So making what you can use in three weeks or so is probably the outside perimeter. Refrigerating the bottles of liquid can extend the shelf life. If it should go bad, you'll notice floating spots on the top. Just restrain the liquid or discard if there is too much sediment. Dried hibiscus petals are readily available both in any herb store or online. I have seen them priced as high as $40 for 2 lbs, or a much more reasonable $12 for 1 lb. Here's the amazing part. You can use some of that dried hibiscus to make your rinse, take your shower, then sit down and make yourself a cup of hot or cold hibiscus tea. It helps lower blood pressure while containing Vitamin C and minerals. You can even snack on the dried petals - they're a delicacy in the Caribbean. If you're growing it at home, you can also shred the bark off the stalk and make a grass skirt, like the Polynesians do. But that's another blog entirely. 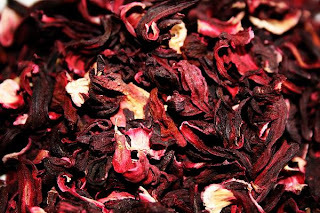 Dried hibiscus petals....perfect for tea, snacking, hair rinse,even making candy if you live in Mexico.